Back in the day, chatbots were nothing more than a fancy toy. They were extremely limited and there was somewhat perverted pleasure in making them uncomfortably baffled by asking something way beyond their reach. All these “Sorry, but I don’t understand” were fun to read. However, with the addition of the Internet to the mix – things have changed. Numerous projects one-upped each other one after another. Then machine learning was fully implemented and the truly majestic thing happened – chatbots became capable of maintaining more or less adequate conversations based on the expansive dictionary, context, and specifics of syntax. Sure, there is still an uncanny valley element in play, but no one really strives for make-believe anymore. However, no matter how mighty and reaching chatbots are – they are just sets of ones and zeroes which need to be taken care off. And there is more than one challenge that comes in a way. They are rather big and they need to be taken seriously. If not – be prepared to utter “mistakes were made” while going through a door. Here are some of the most common. One of the biggest challenges with using chatbots in customer support comes with interpreting the messages and understanding the user intention. Programming flexible algorithms for interpreting the intention of the message is a top priority upon making a chatbot. Unlike machines who know one and only possible way of saying things – people do it in a variety of ways. Some write short sentences. Some write long. Some write in colloquial, some write with bitter err’s. And customer doesn’t really care if that is inappropriate for the machine to understand and they will take no “sorry, I can’t stand it” for an answer. There are several solutions. The simplest one is cautioning the user that he needs to express his cause in general terms so that it will ease the processing of the request. That works for some segment of the customers. But not everybody’s so generous. Because of that, there must be an algorithm to piece together the message from an existing customer’s request and compare it with possible variants based on context. You can go as far as setting up a separate reaction with chatbot doing the second guessing if the term is beyond the database or if there several possible variants. Personalization also eases the whole “you might also like” thing that often puzzles some. Based off already existing requests and tendencies among multiple users – the bot will be able to calculate more feasible offer to the user. The challenge comes with calculating the most appropriate ways of adapting to the user. But it is solved solely through a series of tries and fails in every particular instance. Another thing that needs to be considered is the style of chatbot. The user doesn’t really like to deal with answering machine (which chatbot basically is). They want a little bit more affecting interaction. That means chatbots needs to have some attitude. It can go as far as selecting the gender of a bot. But the most common is selecting several manners of conversing – more formal, informal or flowery or excessively minimalist. Chatbots serve as a double-edged sword. On one side – they help users to sort out the causes. On the other – they provide you with vital information on the said user. While this information is only a fracture of what you are gathering with Ad Tech toolset – it provides vital insights into audience behavior and preferences. And that is the thing you would like to take into consideration. You need to see the big picture in order to assess the effectiveness of the chatbot. In order to do that it must be integrated into the management system with a certain set of metrics so that the incoming information will be sorted out and utilized. This also helps to understand what engages and what scares the audience in a particular episode. That helps to adjust the behavior of the bot and the manner of the replies. It also helps to expose weak points in the presentation of the products. Another big challenge that comes with customizing and adjusting chatbots behavior is understanding the limits of Natural Language Processing (NLP). While it is the backbone of any chatbot – if gone too far it may be as good as dreaming out an elephant in a gulp of a cloud looking exasperated upside down. In other words – it may end up being as incomprehensible as any cat-sitting-on-keyboard sessions. But that is an extreme example – it doesn’t really happen that way. Such things are solved by studying most requested and frequently asked questions. Around this information sets of replies (AKA decision trees) are constructed. In order to make cohesive messages – linking sentences are composed. Note that this thing is perfected in the process on an incoming data thus every good chatbot is unique in its own way. Machine learning is another solution but it needs a very defined set of rules in order to be effective. If not – it will be a mess. However, it makes the process of personalization much easier and significantly improves finding proper answers for user requests. Every mentioned challenge can be solved easily if the professional development team is involved and there is a strong feeling of trust between the project owner and the team. 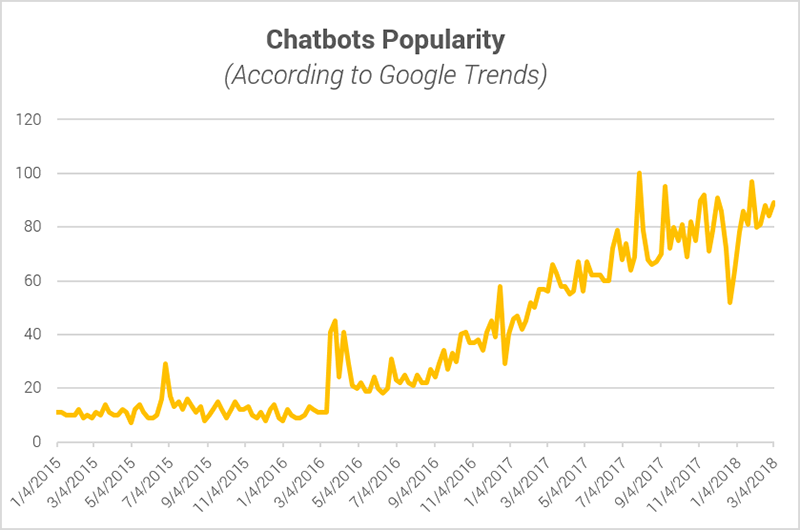 And people are talking more and more about the chatbots, just check out the Google Trends below. So it might be a good thing to think ahead and prepare for your business. Chatbots became more than just gimmicky automated responders – they became valuable sources of information. In many ways, they helped to improve already existing methods of interaction with the customers. On the other hand - they opened up whole new perspectives on a concept. It may be a Pandora’s Box in the end but at the moment it looks more than intriguing.